Colostrum is the first serving of breast fluid produced by a mother mammal for her newborn in the first two days after birth. It contains special antibodies and nutrients that initialize the infant's immune system for its natural functions of controlling the levels of microorganisms in the body. Newborn infants are potentially vulnerable to the millions of microorganisms active in our environment both inside and outside the body. Without colostrum's natural immune support, infants would be much more susceptible to harm from these agents. Colostrum contains vital immunoglobulins, messenger proteins used by the immune system. Supplementing the diet with properly prepared colostrum of high quality has helped people with immune health challenges and various other states of illness. First milking colostrum has been scientifically proven to be the most complete whole food, containing all the necessary vitamins, essential fatty acids, glyconutrients, minerals, amino acids, growth and immune nutrition factors. Some of the components of colostrum are "species specific", and only lend their benefits to offspring of the mother's species. Fortunately, many immune-system messengers found in colostrum will transfer their benefits to mammals of another species. These vital immunity boosters are known as "transfer factors". These teach the immune system to identify infectious agents that have not previously been introduced, preparing it to control these so one is not overwhelmed with them to the point of illness. The transfer factors in colostrum: 1) activate the immune system, priming it to respond when our health is in jeopardy; 2) create additional "memory molecules" which build our potential for immune reaction to attacks from unfriendly microorganisms; and 3) suppress overactive immune functions that cause autoimmune diseases. Colostrum is Mother Nature's perfectly formed natural nano-technology for balancing the body and helping with rejuvenation, regeneration and immune system enhancement and regulation. With all of the essential basic components of a healthy biological system, including immune factors, metabolic agents and anti-aging compounds in their whole food forms, this first food gives us what we need -- health, vitality and youthfulness. Colostrum has been used successfully to help control: viral infection, bacterial infection, yeast and fungus, parasites, autoimmune challenges, chronic fatigue syndrome, fibromyalgia and cancer. Colostrum does not contain milk proteins or lactose, and does not cause allergic reactions in most humans. Colostrum has been used successfully for centuries to provide powerful natural support against age-related dysfunctions. These anti-aging factors support your body to carry on its own natural process of cell regeneration. 25,000 published scientific papers attest to the power of colostrum to benefit the immune system. This whole food provides the support your body needs with an increasingly polluted and toxic environment stressing our immune health. 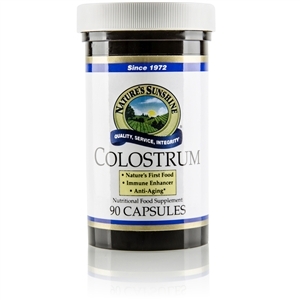 Natural health practitioners have recommended colostrum for many years. 1940's - Colostrum used for rheumatoid arthritis and other ailments. 1950's - Antibodies from colostrum used against polio. 1970's - Immunoglobulins as found in colostrum used to combat viral, bacterial and yeast infections. 1980's - Colostrum components used for autoimmune situations. 1990's - Colostrum found to inhibit the bacteria that causes stomach ulcers. 2000's - IgF-1 and other natural growth factors used for anti-aging as well as enhanced immune response. •Increases the metabolism of fat. ~ Click Here for more information on immune health.